Description: The body is translucent white with a pale brown hue and has scattered patches of reddish-brown pigment. The cerata are numerous, unswollen and have 2-3 subterminal brown bands and a chocolate terminal cap. The oral and rhinophoral tentacles have one brown band. 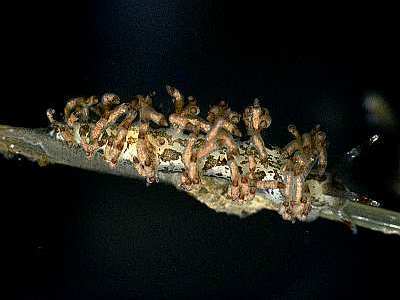 The mature specimens reached 29mm in length. Habitat: Feeds on Kirchenpaueria pinnata. Distribution: Known only from two specimens from Salcombe Estuary. Identified with Eubranchus vittatus by Picton & Brown and Thompson & Brown, but now considered by BEP to be an undescribed species. Picton, B.E. & Morrow, C.C. (2016). Eubranchus sp. . [In] Encyclopedia of Marine Life of Britain and Ireland.